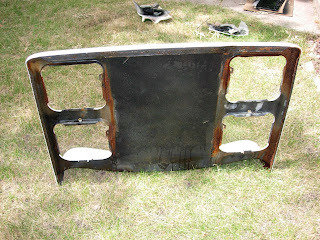 Here are a few more random stove restoration shots. 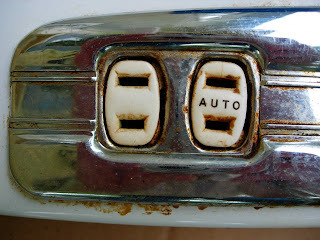 I was finally able to get the stove top off - there was one rusted screw that took a lot of WD40. Yes, this whole thing is taking place in my living room and my front yard. I've started to paint some of the smaller parts. 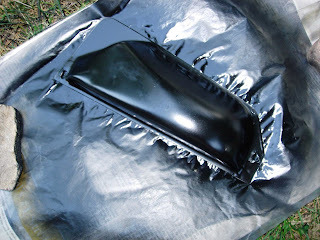 I'm only painting them if there are chips or rust. 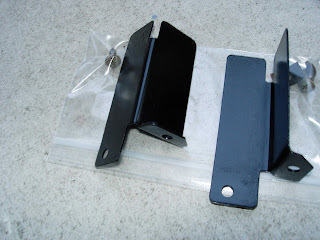 I've been using Rustoleum stove paint for anything that will be near any heat (thanks to the folks at Life In The Praire Box for that tip) and Rustoleum black appliance paint for parts that won't. I have to say, the parts look pretty good when they are done. 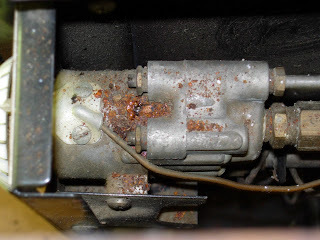 The stuff that looks like rust can be a little deceiving. 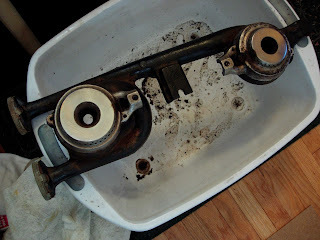 There is rust, but a lot of that is really crud that washes away in hot water and one of those Clorox Magic Erasers (which work really well, but don't last long). I have been taking a ton of photos, drawing pictures and keeping parts in baggies, but there is still a small hysterical voice in my head that is telling me I will never remember how to get this thing back together. 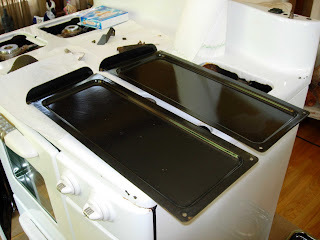 One interesting little tidbit - almost all of the screws used on the stove are the same. 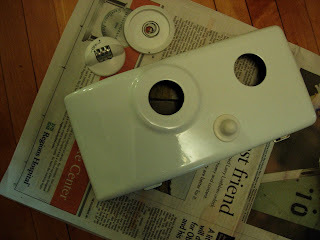 I included a photo of the back of the thermostat. 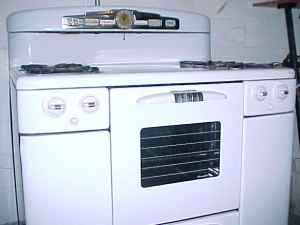 The stove does not have a "safety" meaning that the stove top burners have a standing pilot, but the oven is lit by a match. 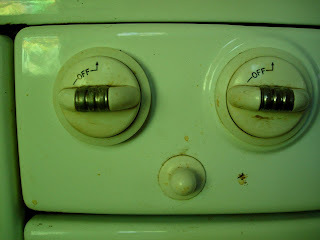 I have been researching, and from what I read a stove safety can be added without too much drama. Last night was our block's ice cream social. We get together twice during the summer - once for the ice cream social and again for a pot luck. The first few years I lived in my house, I had to force myself to go. I didn't know anyone and it was a little awkward. By now I know most of the people and have a good time. I always mean to stay a half an hour or so and end up closing the place down. I really lucked out with my neighbors. They are friendly and entertaining. The turnout is always pretty high, although I've noticed that some of the newer neighbors don't show. We exchange notes about the 'hood (and I assure them I really do have plans to paint the rest of my trim). We catch up on gossip (we think the guy that rented the house on the corner died - and there are new renters). We eat some ice cream. I also think there is some general payoff. 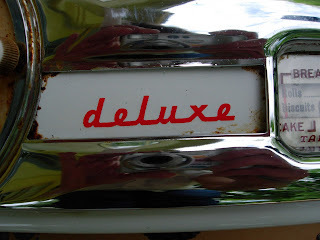 We all are familiar with the cars & the people who live on our block. We know who is generally home during the day and who is around in the evening. We know the kids on the block. We have each other's phone numbers & I don't think anyone would hesitate to call if something was wrong. When we had two "iffy" houses on the block (no longer the case), everyone knew "the situation." And most days you have someone waving to you as you leave your house. 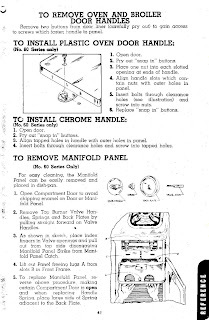 Well, my Tappan Deluxe Owner's Manual arrived this past weekend, and it is everything I had hoped. 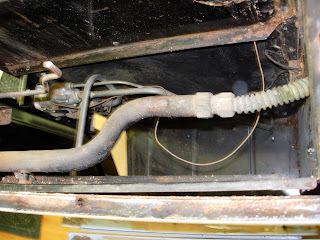 It shows you how to remove things like the manifold cover and the actual gas burners for cleaning. 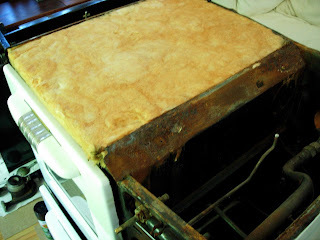 I am much less afraid of the stove now that I realize how simply it works. I am also oh-so-much-more brave in taking it apart to clean. In reading through the Manual, it's actually kind of shocking the faith those companies had in Jane Q. Public. 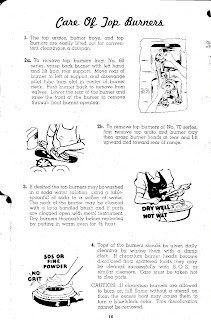 I mean they give instructions on removing the burners & cleaning them. 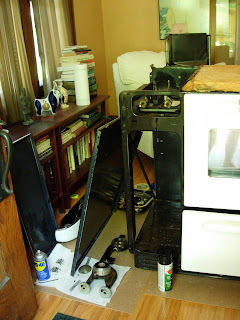 Today, you would never find a stove company providing that kind of instruction for fear of a class action lawsuit. From the looks of the water, I'm the first to learn that both the manifold cover & burners actually could be removed in a long while. And I was quite proud of myself for discovering there are removable drip trays that had not seen the light of day for many years, if ever. 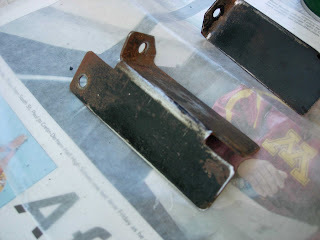 All of these pieces looked alarmingly rusted until they hit the water. Then they cleaned right up like new. Oddly, the water has the vague scent of beef bullion. But, we won't dwell on that. 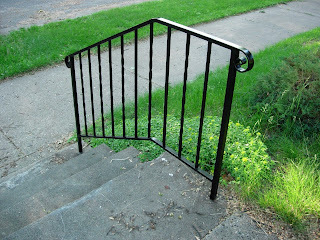 Painted my exterior stair rails on Saturday. I have three of them. I'm pretty sure my neighbors where thinking - whatthehell is she doing when she has trim on nearly the entire front of her house to strip and paint. I don't blame them, but it was one of those things I've been meaning to do since I moved in and was an easy thing to knock off the list and forget about for a few years.....ok, a decade. $1.00 on a recent run through my local salvage place. I have a problem eave. It is where the fascia/bargeboard on the front of my house meets the front door overhang. 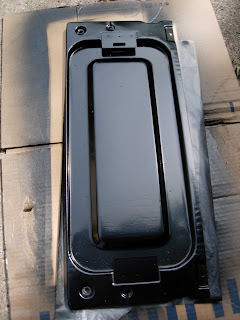 The low pitch overhang currently is done in EPDM membrane. Prior to that it was done in shingles. 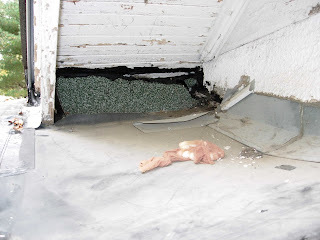 When I had the aluminum pulled down from the eaves last summer, it exposed a nasty little area that still has shingles with a hole that may or may not go directly into my attic. I spent the winter and Spring in denial about it with a plastic sheet duct taped over it. It's time to take care of it, but I so did not want to have to deal with it myself. Especially in my current 9-finger situation. 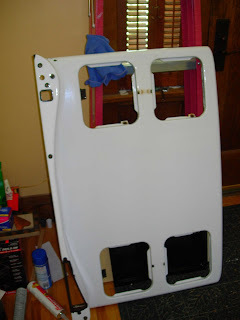 So, I called the same handyman I used to install my salvaged storm door (not the one of Google fame). I supply the materials & direction. He does the work. We set up a day. He gave me a 30 minute window of time in which he'd arrive. I went out and bought the materials. The plan is to fix any problems with the sheathing and then use Eternbond to make the actual repair. This is a temporary fix intended to last a few years until that part of the roof needs to be redone. So, Tues. I was home waiting for him to show up. 20 minutes after the time he was supposed to show up, he called and told me he couldn't come, blah, blah, blah. Needed to reschedule. I was not thrilled because I had rearranged my entire day in order to be there....and rain was expected the rest of the week.....but I agreed. 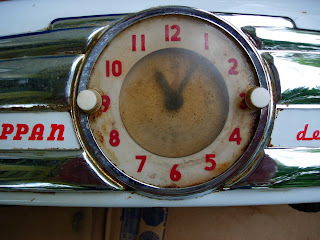 Again, today I was up at the crack of dawn, schedule rearranged, sitting at home waiting for him. 30 minutes after he was supposed to be there, the phone rings. It is him. He can leave now and be there in 20 minutes. Now, this is the same guy who when I first called told me that business was extremely slow. Really. I wonder why. Something in me snapped. I told him not to bother to come. I'd do the project myself. I'm sure I'll curse this decision later when I'm up there on the ladder. I snagged this off of Ebay last night. 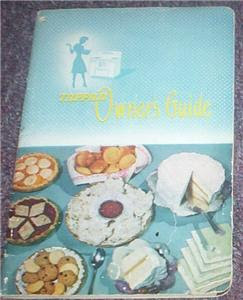 It's a vintage Tappan Owner's Guide. 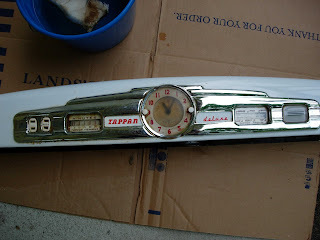 It covers the 1950's Series 60 line of Tappan gas stoves. 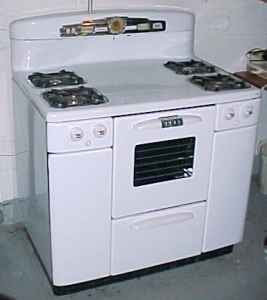 I think my stove is a 1950 model 63. 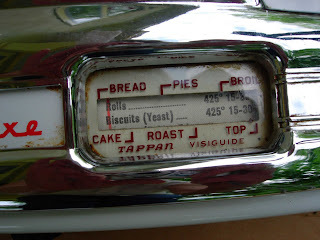 From what I can tell, the guide includes descriptions of the stove's innards, maintenance info., as well as tasty recipes. 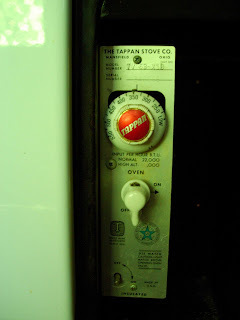 Here are some close up shots of my new (old) Tappan stove. I spent much of the weekend detailing the stove. 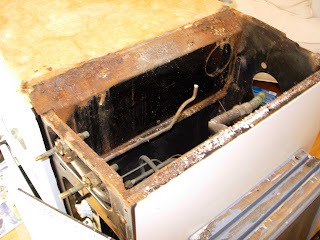 Happily, most of the 58 years worth of crud you see in the photos was easily scrubbed away. It was so hard to keep my mouth shut this week. 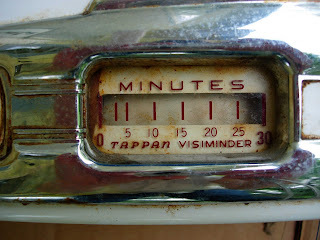 After quietly searching for the past few months, I finally found and bought a vintage stove. I agreed to buy it last week off of Craig's List, but couldn't line up a mover until this morning. 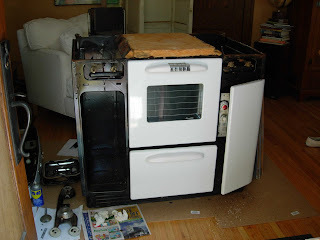 I was stressed all week that someone else would swoop in, make a better offer and steal the stove from right under my nose. 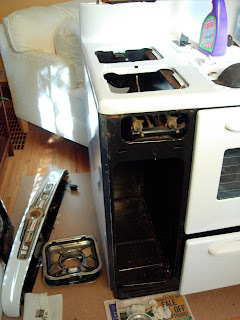 When I first started looking, one of my friends joked about the psychos I would meet on Craig's List and then lived to regret that when he was forced to accompany me on each stove possibility. Except for the guy who would not give out his address until I was in my car ready to drive on the phone with him (I skipped it), everyone I met was quite nice. 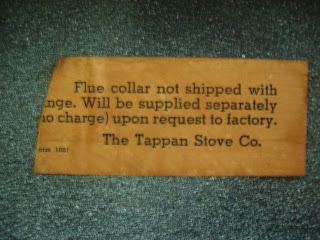 The PO of this stove could not have been more nice or realistic about what it takes to get a stove back to decent condition. 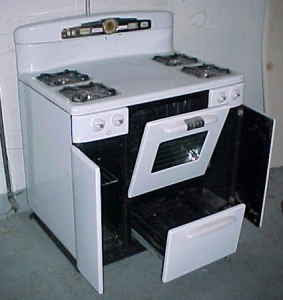 $250 stove & moving. Not a bad deal. Any guesses on age or restoration advice welcomed. Just when the world seems a little bleak and dreary and you least expect it, something wonderful happens. The word "love" does not fully encompass my feelings towards Indian food. I currently drive two suburbs out to eat it on a fairly regular basis. I adore it. If I were on death row and they asked me what I wanted for my last meal, it would be tikka masala and nan....and a diet Coke. So, last night I placed an order for take out beef Delhi Tikka Masala and Aloo Nan from my new neighbors. Let me just say, OMG. Every Saturday at 11am, the MN Dept. of Transportation (MNDoT) leads a tour of the construction of the new I35-W bridge. For those readers not in Minnesota, last August the old bridge tragically collapsed. People gather at the parking ramp on the west bank of the 10th Avenue bridge and the tours leave from there. Look for the guys in the orange vests. Last weekend, my dad and I went down to take the tour. It was a perfect sunny day and we joined 200+ other people down there. The new bridge has twelve concrete & post tension steel piers. You really don't get a sense of how massive it will be until you are standing near it - 5 lanes of traffic each way and a lane for future light rail down the center. They have about 600 people working on the bridge and they work 24/7. They are projecting finishing construction in early Fall. 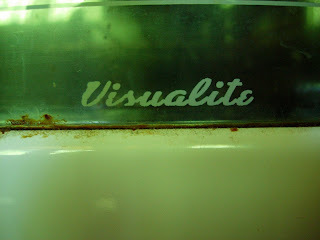 Here are some shots I took. They are working on the bridge from both banks of the river. This week they started working on the concrete that will expanse the river and join the two banks using massive crane on a barge in the river. If you get a chance, take the tour. The DOT website is also very fun to read through. A few quick notes: The steel poles are temporary support.You can see the lock & damn that was used to lower the water level last summer after the old bridge collapsed. The crane used to put the concrete that will span the river is the one loaded on a barge in the river. That's the Minneapolis skyline in the background. And the last photo is of remnants of the old bridge. Warning: Do not read this if you are squeemish. As requested, the gore shot. The cut goes from the top of my finger down to the nail bed and splits the finger through and through. I'm actually lucky it was a clean cut and at an angle that misses the bone. The lower half of the nail is gone now and there are stiches all around. They (and I suppose me too) are worried that the right side will not retain feeling or may not reattach. That's why the referral to the hand surgeon. I have a very high pain tolerance, but this one hurts like the dickens.